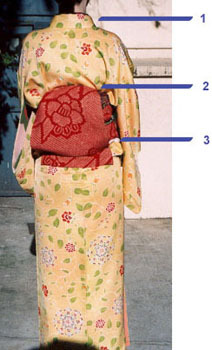 How not to wear a komon (informal) kimono. These are photos from when I first wore this kimono, in January. At the time I had only an obi makura (to give the back knot volume) and some koshihimo (long, two-inch-wide strips of muslin used to hold the underkimono and kimono in place), plus a homemade towel belt to widen my waist. 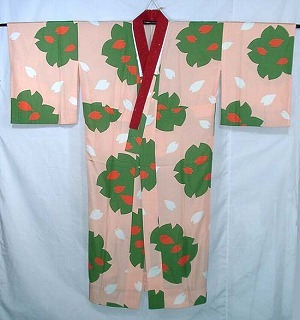 The ideal kimono form is cylindrical, which is why I needed the waist widener. 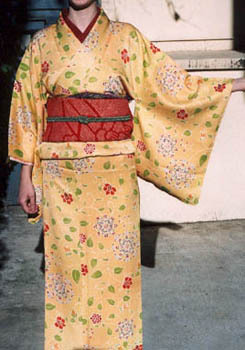 I also have just one juban (underkimono) with a red collar. Other accessories that are nice to have are silk obijime (cord), obiage (obi scarf), obi ita (obi stiffener) and kohlin belt, a contraption that’s basically two clips on a strip of elastic and which helps to keep the collar in the right V. The obijime and obiage in these photos are in fact just a polyester home decorating cord and a Western-style scarf, respectively. The front view is somewhat acceptable: the juban and kimono collars are at proper angles, and the part beneath the obi is okay. However… the ohashori (kimono fold beneath the obi) isn’t straight, the upper part of the kimono should be flatter, and the obiage looks terrible. It should be a consistent, straight fold, without bulges. Also, you can see my juban sleeve poking out on the left – argh! Then there’s the back view. Very embarrassing. 2. What the heck was I doing when I tied this taiko musubi? It looked all right in the mirror. And the upper back part of the kimono is desperately in need of some clean folds to deal with all that excess fabric. 3. Yes, I cheated, the proof is in the white koshihimo peeking out. Never use a polyester cord (“obijime”) to tie an obi, because it’s slippery and doesn’t keep the taiko fold from falling out. I had to cheat with the koshihimo to keep it tied. Now that I’ve got silk obijime, the problem should be solved. At least the tare (obi end) is nice and straight. I’ll be trying again sometime soon with a different kimono, using these photos to try and get it right by avoiding the same mistakes. I’ve also got several more accessories that should help, even though I’d like to learn how to wear kimono without having to depend on them (like the kohlin belt). This entry was posted on Saturday, April 5th, 2003 at 15:07:56	and is filed under Kitsuke. You can follow any responses to this entry through the RSS 2.0 feed. You can leave a response, or trackback from your own site.